Grupo Encuentros consists of mezzo soprano Marta Blanco, pianist Claudio Espector, flutist Fabio Mazzitelli, clarinetist Matias Tchicourel, violinist Sergio Polizzi and violoncellist Carlos Nozzi. 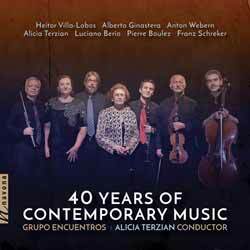 In this CD, saxophonist Maria Noel Luzzardo, oboist Ruben Albornoz, bassoonist Ernesto Imsand and percussionist Arauco Yepes join Encuentros Group. I'm not usually a huge follower of avant-garde composer's work - they tend to see the world through lens that can appear to make them self indulgent and self absorbed - but in spite of myself, I rather enjoyed this release. It rather neatly opens and closes with the album's two most "conventional" classical music pieces, before moving into "darker" territory. It's really an album you have to grow to love. It's doubtful you'll get a huge buzz out of it on the first play through, but if you're looking to grow your library of classical music this is a wonderful introduction to the avant-garde.